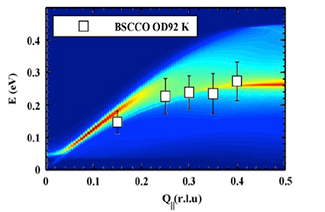 This image shows resonant inelastic X-ray scattering data (in white) compared to the modeled magnetic response in Bi2Sr2CaCu2O8. Changes in the X-ray scattering can be used to see changes in the structure of a material, so the better the data and models become the better we can understand how superconductivity develops. If room-temperature superconductivity was discovered today, it would affect virtually every aspect of your life. Superconductors conduct electricity without loss and expel all magnetic fields. This would mean higher resolution MRIs, lossless electrical transmission, and prolific magnetic levitation transportation, if stable superconductivity was achieved in the air above the current record of -140°C. This is why researchers at the Center for Emergent Superconductivity (CES) are developing new techniques and models to understand how superconductivity develops. This work is described in MPM Dean's current perspectives paper, an expert review of ongoing characterization work at CES. Current superconducting models often focus only on the electrical or magnetic material response, but further insight into the complex coupling of these phenomena is necessary. Developing better superconducting models allows for rapid developments, such as finding higher temperature superconductors and creating better devices, because scientists understand the interplay between electronic and magnetic properties in these materials. Developing better models requires better characterization of the structural, electrical, and magnetic properties in current superconductors. Recent advances in resonant inelastic X-ray scattering (RIXS), which measures the change in energy and momentum of X-rays that scatter from a material, have made it possible to investigate aspects of the structural, electrical, and magnetic response in materials that have previously been inaccessible. Bismuth strontium calcium copper oxide, Bi2Sr2CaCu2O8, is one of these materials that, because it is difficult to grow in large single crystals, lacks magnetic characterization. This material system is of interest because it is one of a relatively few high-temperature copper-based superconductors for which the electronic structure has been extensively and accurately characterized. Combining what is known about the electronic structure of this material with accurate magnetic structure information would shed light on how superconductivity develops within this whole family of materials. The team at CES can now get this magnetic information from RIXS. With this data in hand, comparisons to theoretical models can be made and iterated, like that shown in the figure, leading to a better understanding of how superconductivity emerges. In addition to reducing sample size requirements, RIXS can provide approximately one hundred billion, or 1011, times greater sensitivity than other contemporary X-ray characterization techniques. The resolution of this technique has increased tenfold in the last 12 years, with projected resolution enhancements in the next year increasing the response another tenfold. Higher resolution allows the scientist to gather more information about the materials structure. RIXS can also probe a wider energy range, which can become important when looking at low-energy electron interactions or extracting magnetic spectral information from the background noise. In fact, the ability to take these measurements has already led to highlighting the potential importance of low-energy magnetism in the development of superconductivity in high-temperature copper-based superconductors. As a perspectives paper, the most important outcome of this work will likely not be the synopsis of the current state of the art, but rather the insights it provides into what could be possible. As RIXS characterization is developing, it is important to ask what is next. Dean suggests that higher resolution could allow for the observations of electron-phonon interactions (phonons are vibrations in the materials structure), which in turn could answer some of the long-standing questions about the origins of high-temperature superconductivity. Additionally, RIXS could be used to investigate different scales, such as the multi-layered structures that can now be made by thin film processing. As Dean concludes, "It promises to be an exciting time in the field." This work is supported by the Center for Emergent Superconductivity, an Energy Frontier Research Center, funded by the U.S. Department of Energy, Office of Science, Office of Basic Energy Sciences and by the Office of Basic Energy Sciences, Division of Materials Science and Engineering. The use of the ADRESS beam line at the Swiss Light Source and the ID08 beamline at the European Synchrotron Radiation Facility is gratefully acknowledged. Lauren Garten is a postdoctoral researcher at the National Renewable Energy Laboratory. She is working within the Center for Next Generation Materials by Design Energy Frontier Research Center. Her expertise includes thin film processing, and crystallographic and electronic characterization. Like a leaky pipe, transmission lines waste electricity. While some materials are better at conducting electricity, scientists are after "super" conductors. These materials move energy with no loss. Today, superconductors are only used under special cases when the increased cost of keeping the materials cold is outweighed by the benefit. New techniques are uncovering details that could lead to materials that work at room temperature. An increasingly popular technique is called resonant inelastic X-ray scattering, or RIXS. Coupled with powerful light sources, RIXS provides never-before-seen details about superconductor's electronic and magnetic states. Mark Dean, Center for Emergent Superconductivity, reviewed improvements to RIXS, which has been valuable at his center and elsewhere. His state-of-the science article is showing others what can be done with RIXS and outlines new areas where it could lead to additional discoveries. The Center for Emergent Superconductivity is led by Brookhaven National Laboratory.